Lancôme was born in the heart of Paris in 1935, the ambitious dream of Armand Petitjean - an exceptional man who wished to spread the ineffable spirit of French beauty throughout the world. Petitjean understood that a woman’s beauty stems from the thousand facets of femininity, where the look meets the gesture, the beauty of the body meets the feelings of the soul, and fascination meets emotion. Lancôme’s leadership in fragrances, cosmetics, and skincare rests upon an intimate knowledge of and love for women. Beginning with a selection of five instantly iconic fragrances, Lancôme soon expanded into skincare and makeup. Each product was designed to be the ultimate beauty accessory, with luxurious cases and the highest quality ingredients. Lancôme embodies its commitment to colour, freshness and passion through the symbol of the Lancôme rose, and specially cultivated varieties infuse products such as the Absolue L’Extrait Elixir, a regenerating creme that contains over two million rose cells in each jar. For more than 80 years, Lancôme has been committed to upholding its reputation for offering the highest-quality luxury skincare and makeup products to a loyal worldwide audience. The brand has listened and responded to women’s requests worldwide and continues to develop products that perfectly address the beauty needs of women in all stages of life. 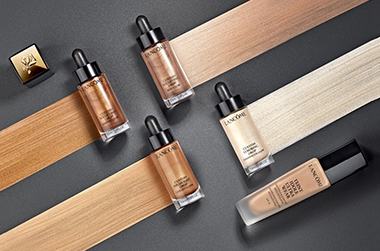 Lancôme continues its constant exploration of the science of beauty by consistently developing and perfecting innovative formulas using exclusive ingredients and surprising textures. From skincare to makeup, Lancôme products have become cult favourites across the world, from the innovation of the Genifique collection to the iconic Hypnôse Mascara. Adore Beauty is an official stockist of Lancôme. Showing 20 products of 77. I usually use soap and water to cleanse my face, as I don't like to go to bed with a "sticky face"! What a beautiful experience, using the Lancôme Mousse. I like to wet my hands and just smooth it on. So light and fluffy, then I wash it off with a flannel. My normally sensitive (and mature) skin feels hydrated with a lovely lingering scent.